The Takamine LTD-2001. With this year's limited edition guitar, Kaman Music and Takamine partnered with the Cousteau Society to help bring awareness to the plight of our ocean's habitats. Returning to a more traditional 'ring' rosette, this repeating dolphin motif creates an ornate visual pattern when viewed as a whole. 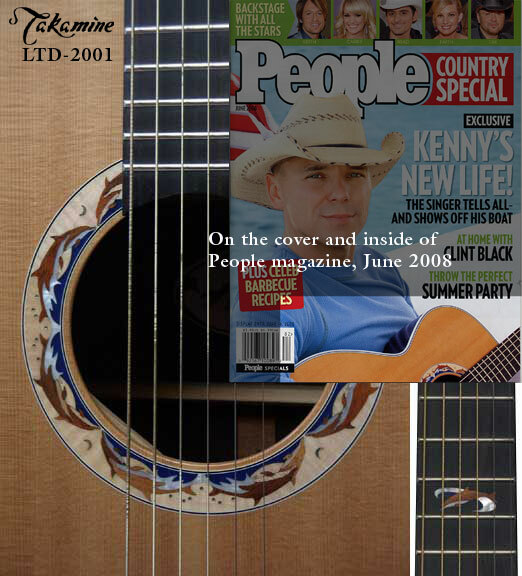 The fingerboard inlay is a simple dolphin adorning the 12th fret.